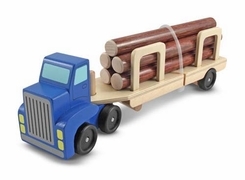 This wooden big rig is up to the big job of hauling logs from the forest to the lumberyard! Five freshly sawn logs are held in place by an easy-release security strap to prevent the load from shifting on the open road. A great toy for the development of language, fine motor and imaginative play skills.